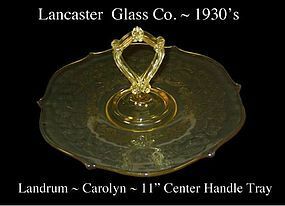 This yellow center handled sandwich server was made by The Lancaster Glass Co. in the 1930's. Lancaster was purchased by Hocking at a later date. This tray is in excellent condition with no damage. The pattern is called Carolyn which we identified by Weatherman Book II on page 221 in the Lancaster section. Some collectors call it Landrum, and the 2 patterns are very similar. This pattern is getting harder to find. 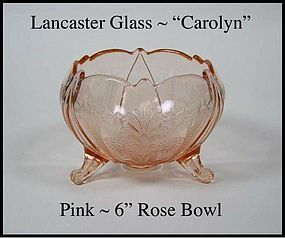 This hard to find pink 6 inch rose bowl was made by The Lancaster Glass Co. in the 1930's. Lancaster was purchased by Hocking at a later date. This bowl is in excellent condition with no damage. The pattern is called Carolyn which we identified by Weatherman Book II on page 221 in the Lancaster section. This is the only rose bowl like this in pink we have seen. This bowl is in the same beautiful color as Pink Mayfair and the pattern is strong.